For many who find themselves in the position of needing to fill in a gap in their smiles, it’s reassuring to know that there are a variety of good tooth replacement options. People have been needing tooth replacement for many years. The practice is believed to have originated in Ancient Europe, where people were using shells and ivory as imitation teeth. In Italy, people were replacing a natural tooth with a fake one made from whittled ox bones. In some primitive societies, people tried to replace teeth with other animal teeth. In Honduras, Mayans around 600 AD were using shells as well to take the place of teeth that had fallen out. Shells and bones were popular substitutions for tooth loss issues around the world, but they weren’t the only thing dentists were trying. In the 1800’s, dentists even tried something that sounded logical; taking teeth from another’s mouth to use as implants. 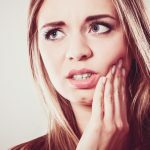 However, these often resulted in infections, as the person receiving the tooth did not typically react well to foreign teeth. Soon precious metals were also being utilized as false teeth, faring little better than natural transplanted teeth. It was a growing field, and one that was nowhere near as safe as it is today. Now, if you have lost a tooth, or a few teeth, you can get dentures to fill in the gap. And these dentures have come a long way from what was used in the past. Materials are utilized with adaptation in mind; in other words, we want dentures which contain materials that fit into what our bodies need. Each implant is unique and made in such a way that it fits the contour and shape of each person’s mouth, which is accomplished by creating an impression of your mouth. Coatings of implants can also differ, depending on the type you need (two common coatings are hydroxylapatite and titanium plasma), and you can even sometimes select what kind of gum shading and texture you want. The goal is to help minimize or completely erase the appearance of any gaps, not only so that you can look and feel confident, but also so that you can chew and enunciate properly. Many people wonder how much space dentures will be able to fill in their mouths, and this really depends on what your specific needs are. The mold the dentist creates of your mouth can include the whole upper arch, for instance. In some cases, partial dentures are needed when there aren’t sufficient teeth remaining in the area. Partial dentures are sometimes advantageous when compared to full dentures because you can easily take them out and cleanse them after a particularly messy meal, for instance. Some people also enjoy taking them out if their gums become sore, kind of like you’d take out a pair of contacts if your eyes become tired. Plus, they tend to be much cheaper. The downsides are that the dentures may be stiffer or more uncomfortable than full dentures, and you might not see the results you want when it comes to speaking clearly and chewing tough foods easily. And because dentures aren’t as stable as implants, you may see a change in how your mouth and cheeks look due to some deterioration of the bones beneath the partial denture as the years go on. 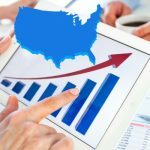 Whether you go for a more permanent solution or for temporary dentures is up to you, as there are pros and cons to each. Overall, dentures will boost your bone’s natural growth rate, help support nearby teeth, return your smile to how it was before you lost your teeth, and help with chewing food as well as speaking. 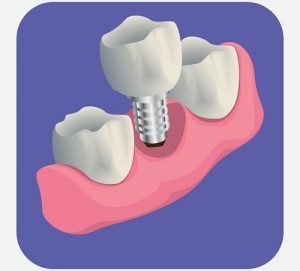 Dental implants come in two main categories, depending on how they’re placed into your body: subperiosteal (an implant which is set onto the bone) and endosteal (an implant which is placed into the jawbone). The success rate of implants is high; many dentists have a successful surgery rate of over 95%. These are a little less popular than implants. Having a fix bridge placed in your mouth involves sanding down the teeth next to the missing tooth or teeth, then creating a bridge across the teeth so that the crown is supported. If you go this route, you’ll need to continue to check up on the bridge to make sure it remains in place. Removable dentures are an option, but many prefer dental implants for single tooth replacement because they’re more stable. Dentures may once in a while slip out of your mouth if you’re coughing, kissing someone, yawning, or laughing. They’re also simple to clean, affordable, and easy to take out if they’re making your gums sore. People like the versatility and comfortable fit of these, and the fact that there’s not much maintenance involved. “The old saying ‘You get what you pay for’ applies to tooth replacement options. Dentists have many options that will work to replace your missing teeth and improve your smile. But all options are not created equally when it comes to comfort, stability of the replacement appliance, chewing capacity, and aesthetics. If you choose a dental implant, you’re going the most popular route when it comes to replacing your teeth. This is because, by placing an imitation tooth in your mouth, you’re aiding bone growth as the gums and jaw bone grows into the implant. This option is not cheap and do require some upkeep, but implants are considered one of the best solutions to a gap in your smile. And they last quite a while. Another benefit of a dental implant is that cavities cannot form in it, so you have one less thing to worry about, though you should continue to clean them. Simply brush and floss your implants like you would your original teeth; it’s important to keep up an oral hygiene routine, so that you continue to prevent plaque and bacteria from accumulating. 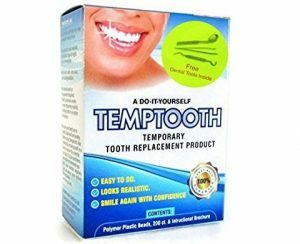 There are also some temporary solutions you can use to replace teeth in a pinch. 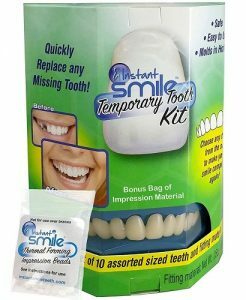 We like the Temptooth products and the Instant Smile kit. You can even buy crown material or veneers. 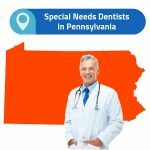 Though the quality of these may not be the best, they’ll likely arrive quickly, and they’ll do the trick until you’re able to go to the dentist for a better solution, so that you’re not walking around with a gaping hole in your mouth. According to Dr. Seuss, teeth are always in style. And we agree—it’s true. Though you may not spend a lot of time thinking about your teeth as you go about your day-to-day routine, our teeth (or the temporary or permanent implements replacing them) are an incredibly important part of our bodies. Strong teeth help you to digest your food and to extract the most nutrients possible from a meal. They help maintain the shape of your face and the kind of smile you have. The shape of our teeth contributes to the distinctive features of our face, the parts of us that make us ourselves. Teeth help keep your cheeks from sagging or from looking sunken and gaunt. Your teeth also help keep the bone beneath the skin safe, so that your jawbone doesn’t wear away, and implants can boost growth of the bone, minimizing loss of bone mass. So, as we learn to recognize and to educate ourselves on the importance of our teeth, perhaps we can begin taking better care of them and teaching those around us to do the same. 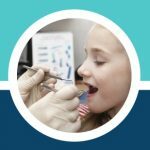 Replace Missing Front Tooth: What Are the Best Options in 2019?